Switching to single-file mode: double-click or Menu – View – Switch to single image or pressing Enter (if the keyboard focus is on the window with the file previews). Rotation (Menu-Adjust-Rotate), the new orientation data will be recorded in the XMP-file (see below). Assigning a rating/label (Menu – XMP Metadata), if changed, the rating and label will be recorded into an XMP-file. Copying (Menu – File – Copy), moving (Menu – File – Move), copying to the _Rejected files folder, which is for those, which you may want to delete at a later stage (see below). Sending a file for processing in an external program (Menu – File – Pass filename to). Display of a file in a system file manager (Menu – File – Show in Explorer/Reveal in Finder). 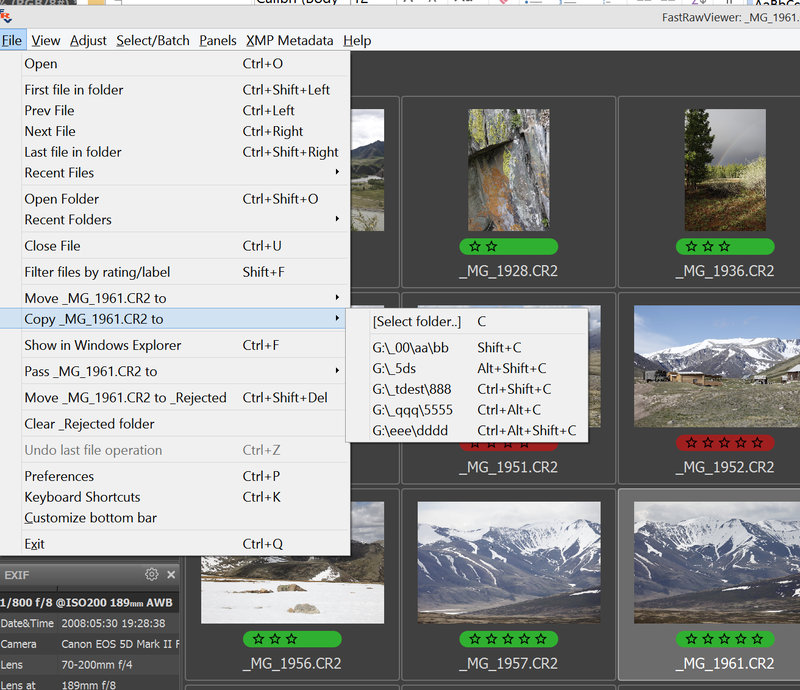 The current (highlighted) file in the Grid View can be copied to another folder with Menu – File – Copy filename to – [Select Folder] (or pressing C). The dialog to select the destination folder will appear, and after the destination folder is selected the file will be copied. The names of the folders which were used for copy operations are stored in the menu items below Menu – File – Copy .. to – [Select folder]. The most recent copy destination is at the top of this list, below are the folders which were used earlier. The list can contain up to five folders. All of the folders in this list can be accessed through the keyboard (C, Shift-C, etc. ), which allows one to conveniently copy to those destinations without accessing the menu. The lists for copy and move destinations are kept separately. External JPEG-file (in RAW+JPEG mode). XMP- sidecar file (if it exists). .rpps sidecar file (if .rpps sidecar file recording is turned on). 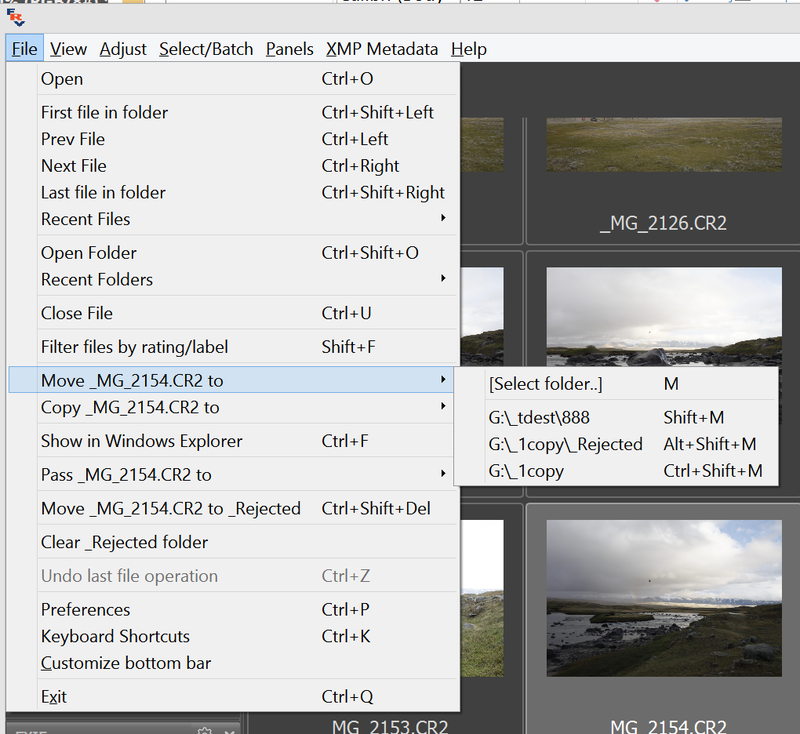 Other files according to the setting Preferences – Copy/Move/Reject - Additional file extensions to copy/move with file. This setting is described in more detail in the section Program Settings – File Handling - Copy/Move/Reject. When doing sensitive work and/or using unreliable media, the Preferences – File Handling - Copy/Move/Reject - Verify file contents after copy setting may come in handy, as it turns on data verification after copying. The folders that served as destinations for copy and move operations are organized in lists that are accessible through Menu – File – Move/Copy (and are also accessible through context menus). Please put checkmarks next to the names of the lists you want to reset. FastRawViewer supports a separate mode to quickly copy/move a file (or files, see below) into a subfolder in the current folder. The selected file will be copied or moved into it (if it’s a group of files, see below). The history of used subfolders is the same for copying and for moving. There are many situations when the system “trashbin” can’t be used (removable drives, network folders and drives); also, in certain cases the operational system may delete part of the content of the system trashbin (for example, when the size of the trashbin is over the limit) without even requesting confirmation from the user. Flash cards and card readers are prone to hardware malfunctions, and moving a file into a subfolder is the safest file operation. Use global rejected folder – Check. Select the path for the Global Rejected Folder. To delete the contents of the _Rejected folder, use Menu – File – Clear _Rejected folder. You cannot set a hotkey for the Clear _Rejected action. The OK button will only be accessible after checking Yes, I’m sure checkbox. Show in Explorer button (Mac: Reveal in Finder) allows one to look at the content of _Rejected folder using the file manager. The additional Delete read-only files too checkmark allows one to delete files with the Read-Only attribute; if this checkmark is not set then those files will be ignored and will remain in _Rejected. Attention: Mac OS X does not support the Read-Only attribute on the FAT/exFAT systems, so on OS X the Read-Only checkmark will only work on local and network drives, but will not work (i.e. checked on) on removable media (memory cards). Note: Menu – File – Clear _Rejected is not available if global rejected folder is used. By default, this feature is turned off; it needs to be turned on through Preferences – Copy/Move/Reject – Enable move to _Selected folder; this is the same place where the name of the subfolder is set. The hotkey for moving files to _Selected is not set by default, it needs to be manually assigned through the hotkey editor in the File Copy/Move/Reject section for hotkeys (see the section on “Setting the keyboard shortcuts” in this Manual). There is no operation analogous to Clear _Rejected Folder. FastRawViewer can start external programs, passing them the current RAW file as a parameter. This way any program that takes the file name as a command line parameter can be launched, be it a RAW convertor, different image viewer, or whatever program you may need. If, on the first run, FastRawViewer was unable to find the program you need, it can be added to the list of external programs manually through Preferences – External Editors. 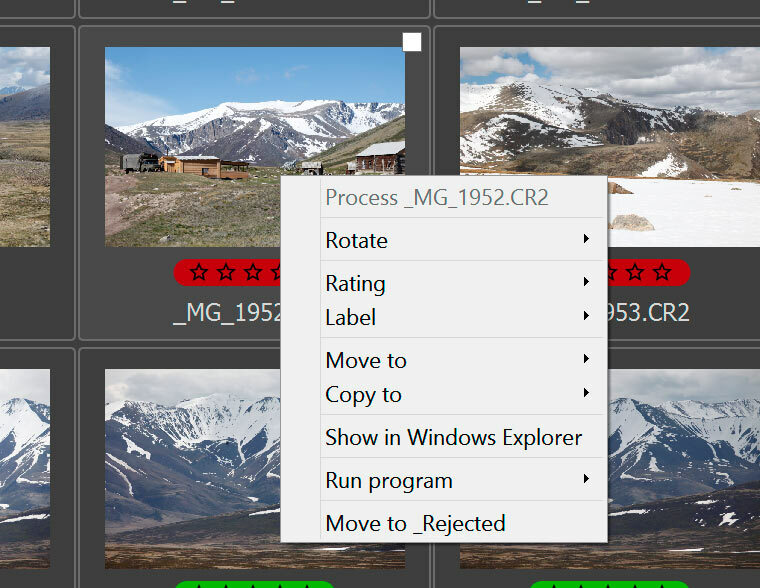 To launch an external program to process the currently displayed image you can use Menu – File – Run – necessary program or with press one of R for the first external program, Alt-R for the second, and Ctrl-R for the third. Display of the current file in Windows Explorer (on Windows) /Finder (on Mac) can be done through Menu – File – Show in Windows Explorer / - Reveal in Finder. Default keyboard combination – Ctrl-F.